Enterprise Edition clients can choose to automatically translate open-ended feedback commentary from one language to another so that end users can read their entire report in their preferred language. 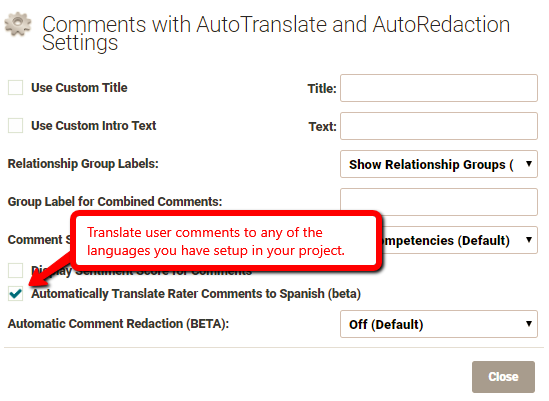 Add the “Comments with Auto Translate and Auto Redaction” component to your template. Here, you will find the option to turn on or off the translation feature by checking or unchecking the box next to the languages you have setup in your project. NOTE: Comments that are automatically translated are flagged so it's clear to the reader that they are not original.